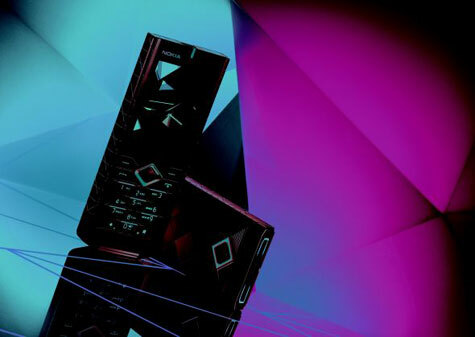 Opposite its sleek, liquorice-black front, the Nokia 7900 Prism comes with an anodized aluminium backcover, which is coin-stamped and laser-etched in Nokia Prism’s signature diamond-cut design. Its design is amongst the first to feature an Organic LED main display that supports up to 16 million colors and displays light-focused screensaver graphics. In addition, the Nokia 7900 Prism features a “living wallpaper”, which subtly changes throughout the day according to time as well as battery and signal strength, so that each screen is unique. For greater personalization, the Nokia 7900 Prism offers a gallery choice of 49 illumination colors. Once selected, this color radiates from under the graphic key-mat as well as from the LED display. Lights are also emitted from the top of the phone to signal missed calls and messages. The Nokia 7900 Prism features dual band 3G technology for fast and easy downloads and browsing, and quad band GSM capability for worldwide connectivity. In addition to a 2 Mpx camera, the Nokia 7900 Prism comes with 1GB of internal memory for lots of pictures, video, contacts and more. The Nokia 7500 Prism is the Nokia 7900 Prism’s quirky sibling. 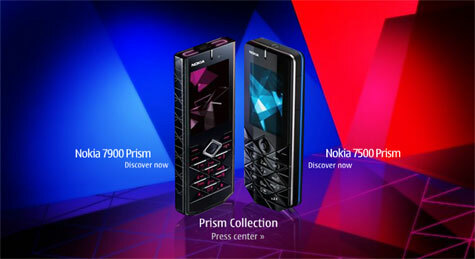 The Nokia 7500 Prism’s slick black exterior is spliced with bright, interchangeable color accents. The Nokia 7500 Prism has a 2 Mpx camera and it can record high quality movies. The Nokia 7500 Prism can play music for nine hours and hold up to 1500 songs on an optional 2 GB microSD card.